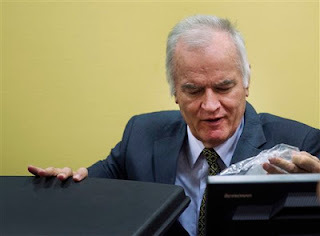 Ratko Mladic, the man accused of masterminding the massacre of more than 8,000 Bosniaks in the Bosnian town of Srebrenica during the 1992 - 1995 Bosnian war, appeared in court on 16 May 2012 and showed no remorse or respect for the victims of the heinous crimes he is accused of orchestrating. The man dubbed "the Butcher of Bosnia" appeared at the International Criminal Tribunal for the Former Yugoslavia in the Hague as his war crimes trial began and did the unthinkable. He reportedly stared at family members of victims and/or survivors of the Bosnia war carnage in the audience and drew his hand across his neck as if cutting a throat. It has been said that actions speak louder than words. We all know what a throat slash or "cut throat" gesture means. It connotes cutting a person's throat with a blade. Gestures confer different meanings in different cultures, but the "cut-throat" gesture is considered a death threat in many societies. The throat slash gesture does not help Mladic's case. The 70-year-old former General of the Bosnian Serb army is on trial for genocide (11 counts), war crimes and crimes against humanity. He is Europe's highest-ranking war crimes suspect. [Source]. Mladic was a fugitive for 16 years until he was arrested on 26 May 2011 and extradited to the Hague less a week later. The 1992 - 1995 Bosnian civil war claimed 100,000 lives and left 2.2million people homeless as Bosnian Serbs carried out a campaign of ethnic cleansing targeting non-Serbs. Mladic was the Bosnian Serb commander during the massacre in Srebrenica and the 43-month siege of Sarajevo. [Source]. Since General Mladic made his first court appearance in 2011, he has been defiant and has so far shown no remorse. At the moment, he seems to be having fun disrespecting the court and those affected by the massacre in Srebrenica, but at the end of what promises to be a long and difficult trial, I'm confident that victims and families affected by his alleged crimes will have the last laugh. It has been said that "the wheels of justice turn slowly but exceedingly fine." For 16 years Ratko Mladic eluded the law but he was finally arrested and dragged to the Hague. As we speak, other people wanted for international crimes, including folks like Omar al-Bashir and Joseph Kony, think they would elude justice. No matter how long they stay at large, they will eventually be nabbed. An African proverb states that "a debt may get moldy, but it never decays." In the same way, an arrest warrant for international crimes may get moldy, but it would never decay. As for Ratko Mladic, "the Butcher of Bosnia" who doubles as "Europe's highest-ranking war crimes suspect," justice has started taking its course. Irrespective of what he does in the courtroom during his trial, it's only a matter of time before the chickens come home to roost.